When you read a list of video game villains, one character always seems to be missing: Tom Nook. Utterly ruthless, he’s a forceful time-share salesman masquerading as a simple, harmless realtor. Animal Crossing: New Leaf changes up the tried and tested method of you moving to a new town and immediately incurring masses of mortgage-based debt, in favour of you moving to a new town and immediately incurring masses of mortgage-based debt whilst being the Mayor. 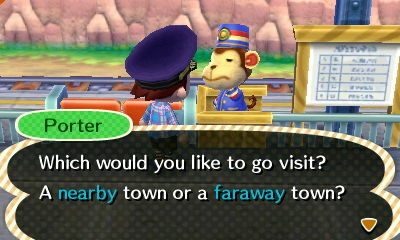 You’d think it’d afford you some kind of luxury, being the Mayor, but no. Within the first hour, you’ll already owe Tom Nook 10,000 Bells (the currency of Animal Crossing), and while you don’t have to pay him right away, you’ll be living in a tent until you do. Long-time fans of the series will feel incredibly at home with New Leaf, and in no time you’ll be earning Bells by shaking fruit from trees, catching fish, scouring the beach for shells, capturing insects, and generally acting like a rag and bone man, selling everything you can to the local recycling centre, just to pay your debts. Not to forget, you’ll also be digging up fossils, planting trees, chatting to your new animal neighbours, all the while continuing to obsessively tidy your house, moving furniture around because it has to be “just so”. And it was around the time of writing the above that I realised: Somehow, this game has gotten its hooks into me again. I found myself annoyed that I couldn’t get into Tom Nook’s place of business and pay my debt off, because his opening hours were only 10am-8pm. I found it positively disgraceful that the recycle shop wasn’t open 24 hours a day. Don’t they know I’m addicted to shaking trees for fruit? Don’t they know how badly I need to make money? 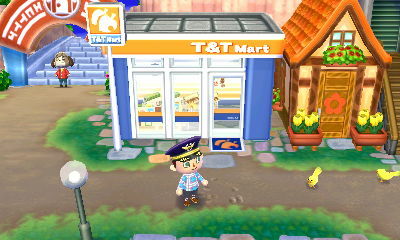 The fact that New Leaf is persistent, and based on real-world time scales, means that shops do shut, as well as sell out. Timmy and Tommy are the resident shopkeepers, so if you buy the shovel and the net on day one, those items will be sold out until the next day when the stock is replenished with another two random items. What this means is that, whilst a second player can also inhabit your world using the same game-cart (though they won’t be Mayor, just a resident), they can’t buy things that are sold out. So if your wife (and I speak from experience here) buys the only shovel, you are out of luck. You’ll probably be wondering what has changed though and, in truth, besides a shiny lick of 3DS-paint, to begin with there isn’t an awful lot different to previous versions of Animal Crossing. There are minor tweaks, like the ability to refuse an offer for what you are selling, instead putting it onto the flea-market where you can set your price and hope you make better money that way. You can take photographs with the 3DS console’s built in cameras, too. Of course, everything from previous games returns, like the Museum, which offers you the choice to donate your fossils, insects, fish, and paintings for no monetary reward, instead filling out the museum’s collection and thus making your town a more attractive place to live. It’s the angle of “being the Mayor” that makes New Leaf so interesting, though. Once you’ve cut your teeth by getting used to the day to day minutia of making money and speaking with citizens, you’ll get the chance to actually change your town’s appearance. At first, it seemed oddly awkward that there was only one bridge in my town, because it meant that there were some locations that take longer to reach than others. But the Mayor? He can make this a better place, he can build a bridge elsewhere (up to 3 total, in fact) and make getting around much easier. But convenience comes at a price, and the bridge-building is funded via donations. Guess who has to donate? Well, everyone actually. Other residents (AI, online visitors, or otherwise) can help pay the cost of building that bridge, the park, the fountain, or any of the other improvements to the town they live in. It’s a simple yet effective way of making the player want to earn more money than ever, which means spending more time with Animal Crossing. 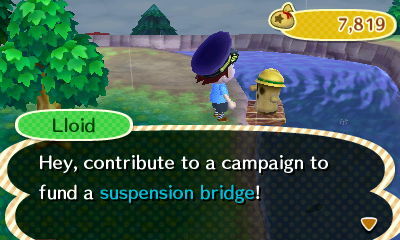 As the Mayor, you can also change what makes your town tick via ordinance instructions. Perhaps you want to make your town a rich place, meaning the things you sell will make more money, or perhaps you want your town to be a more beautiful location overall? You can make this happen, and it adds more of your personality to the abundance of character and charm that Animal Crossing already has. Play coins are rarely an important – or even noteworthy – factor, but New Leaf has found a way to get people carrying their 3DS console wherever they go. 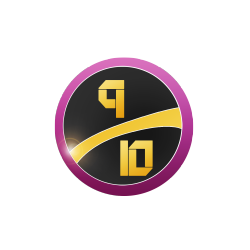 Fortune Cookies are only available to purchase via play coins, and once eaten they reveal a token that will net you a rare reward. Thankfully, the 10 play coin a day limit set on the 3DS hardware isn’t a factor, as the shop only has one available to to purchase per day anyway. It’s yet another reminder that the town you inhabit is alive, and continues with or without you. You’ll get asked to meet people at a set time, on a set date – and if you miss that meeting after agreeing, you will be called out on it. There are numerous options to play with others, whether it’s via the standard streetpass options that most 3DS games include, or by opening your town gates to near (other 3DS users in your local vicinity) or far-away visitors. By opening the gates to your internet friends-list, you also invite the potential for people ruining your experience. To combat this, if someone is making a nuisance of themselves by being terribly unfunny and ruining your town, you can hit the start button and remove them from the game. It’s a smart move that means no outside influence can ruin the experience, unless you want it to. As with all Animal Crossing games, visiting other people’s towns means you can pick their fruit and fauna and take it home to make your own town a richer place. You’ll have a starting fruit in your town, but will have to venture outside your own home to find new and exciting fruits. But this time, there’s also a tropical island you can visit via boat, and it’s one that hosts a ridiculous volume of rare and just plain different fruits, insects, and fish – so much so you’ll almost make it a daily trip, as it’s such a quick way to make money. 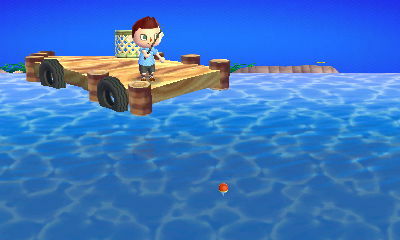 There are also mini-games available on the island that all revolve around pre-existing mechanics, such as catching insects with your net. These are playable with friends, so if you have people visiting your town, you can all hop onto the boat and go and experience this fun together. It’s probably on the island that you’ll first encounter the wet-suit, too. This allows you to venture into the sea itself, and dive underwater (still wearing whatever hat or wig you had on, of course) to find yet more items to collect and sell. There’s just so much to do in Animal Crossing: New Leaf that, despite it becoming a grind at times, the variation means it’s never boring, and when you throw in the fact your town is constantly evolving, whether it be your home growing larger, or the shops themselves changing from a tiny corner shop to a massive department store – or even entirely new buildings hitting your hight street – you’ll lose 30 plus hours before you even realise it. 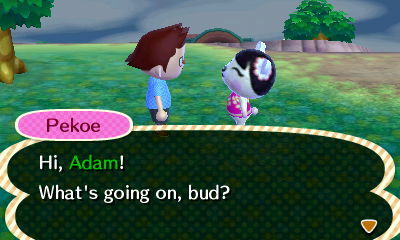 New Leaf really does look great, too, and the 3D is easy on the eyes, if not entirely essential. Going back to the DS version of Animal Crossing makes you appreciate the graphical overhaul hugely, and tiny touches such as footprints in the sand really do enhance the overall experience of immersing you in the game. It’s pretty difficult not to fall in love with the daft-looking animals that have ridiculous names – the cat called Rover that chats to you on the train to your new town, for example – and the audio matches the visual design. The almost Simlish language spoken by each and every animal is cute, but daft. Hearing a hilarious Duck-based theme as you speak to the resident Duck is as brilliant as ever. VERDICT: Lord knows how, but Nintendo have devised yet another way to grab people’s attention and hold it with steadfast loyalty on their 3DS. Animal Crossing: New Leaf appeals to the family in a way few games do, allowing Mum, Dad and the Kids to inhabit a virtual world full of cutesy animals. It fosters a truly co-operative experience, but reminds us all that hard work has benefits. One of the most addictive video games in living memory, Animal Crossing: New Leaf is both a blessing and a curse. A blessing because it’s a wonderful example of Nintendo magic, but a curse because I’ve not had my 3DS back for days on end. Who’d be a Mayor, eh?